G. W. McKenney Sr. b. 1832 and Isabella are in the Enoch, Monroe, Ohio census living next to Enoch Hays then Jacob Miller who is married to Jane Scarborough (the sister of Rhoda Scarborough who married G. W. McKenney b. 1816 the conjectured uncle of my G. W.) Then there is the household of Margaret McKenney, widow of Robert McKenney b. 1770 who has died. John McKenney 2 of Oxford b. 1795-1805, who was on the same page as Robert Sr. in the 1830 census, has up and disappeared between 1840 and 1850. His wife is unidentified and (if William b. 1827 and George b. 1832 are his sons) this leaves at least 6 males and 3 females unidentified. The eldest male would now be 25 to 30, as would the eldest female, there would be two males 20 to 25 years of age and 1 female 20 to 25 years of age, 3 males 15 to 20 years of age and 1 female 10 to 15 years of age. All those McKenneys! Someone find ’em! Certainly there are descendants out there looking for their families of origin? NOTE: Enoch HAYES b. 18 March 1817 Noble Co. OH, died 4 August 1874 OH Father Frederick HAYES b. abt. 1784 in NC and Elizabeth b. 1795 GA. Married Rachel MARCHBANKS b. 8 Oct. 1822 in Nobel Co. OH or Lanark, Dumfrey, Scotland. From what I see of the family given on the web they stayed in Ohio. MARCHBANKS is also given as MARSHBANK at HAYES Genforum. The 1830 Guersey Co. Beaver census shows Edmund HAISE, Bailey HAISE, Ogden GREY, John TOWNSEND, John MCKINNEY 3 1 – – 1/1 1 – – 1, Henry MORGAN, WIlliam DOWNEY. Edmund and Bailey appear to be sons of a brother of Frederick HAYES, named Bailey, b. 1775 in GA., died 1845 in Guernsey. Further down the page is Robert MCKINNEY – – 1 – 2 – – 1/ – – – – 2 – 1. Etc. See preceding posts on this census. See 1840 Monroe census showing Robert MCLUNNY in this place. This is Margaret, widow of Robert McKenney b. 1770. I have found an old source that gives Margaret as mother to George W. McKenney b. 1816. Ann appears to be one of the daughters. But who is Margaret? A granddaughter? Whose daughter? Robert is perhaps the 30 to 40 year old male in the 1840 Robert McKenney census All of these people disappear after this year. Both Margarets and and Ann and Robert all disappear. George W. McKenney b. 1816, son of Robert McKenney b. c. 1770, is also living in Enoch, Monroe, Ohio with his wife Rhoda Scarborough. NOTE: It is difficult to tell if this name is McKinney or not. Rebecca SCARBOROUGH married George MCKINNEY (household #344 1850 Monroe County, Enoch census). Her sister Jane married Jacob MILLER. Residing between G. W. MCKENNEY Sr. b. 1832 and Margaret MCKENNEY in the 1850 Monroe Co. Enoch census is Rebecca SCARBOROUGH’s sister who married Jacob MILLER.This is Jacob MILLER Jr. b. 1803 in Washington Township PA, died 16 March 1894 in Cambridge, Center Twp., Guernsey Co. OH. Rhoda’s parents were Joseph SCARBOROUGH Jr. b. 20 Jan 1776 in Bucks Co. PA and Rebecca BARNETT b. 1786 in PA. Rhoda’s sister Jane married Jacob MILLER son of Jacob MILLER in Guernsey. The 1830 Guernsey OH census shows a Jacob MILLER with one 15-20 year old son living between Timothy SHARRICK? and Benjamin STIGLER. Further down that page is a Peter YAGGE or YAGGER living next to a William SHAFER. Rhoda’s father died in 1825. 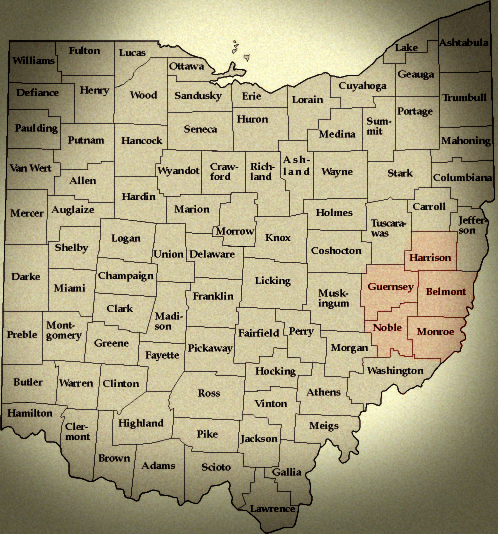 Her family is perhaps that of Rebecca SCARBROT observed in 1830 Guernsey County, Center Township, pg. 458. In 1830 her brother Benjamin is in Belmont CO., Pultney, pg. 277 residing two households from a James KELSEY Jr. who is not likely related to the KELSEYs residing next to William MCKINNEY b. 1827 in 1850 Van Buren Co. IA. There are no familiar names beside the SCARBOROUGHS in the 1830 and 1840 census. Guess who else has disappeared? John McKenney 1 b. 1795-1805. Oxford, Guernsey, Ohio shows Rebecca McKenney (conjectured widow of John McKenney 1) living beside Isaac Montgomery who was neighboring in 1840. McNeeleys are in both households. These families are likely related. 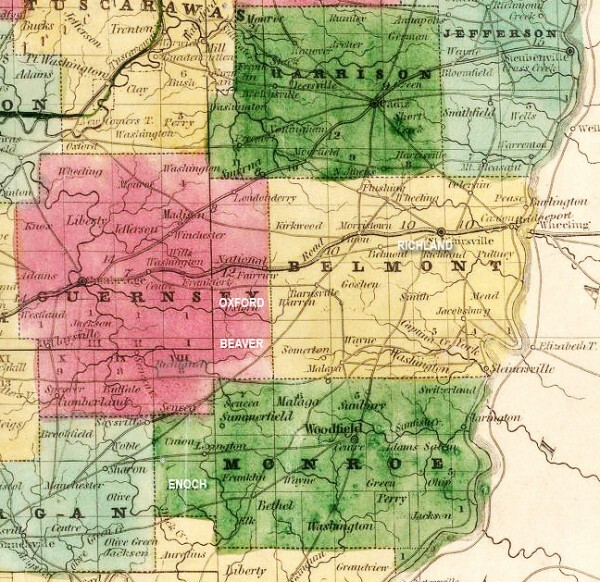 (A brother, James Montgomery, dies in Grant, Indiana in 1867, and McKenneys have moved to Grant, Indiana by that time.) John McNeeley is in the Isaac Montgomery household. His son James’ mother-in-law was Margaret McKinney Delong. She was born about 1790 in Pennsylvania and married to Solomon Delong in 1807 in Jefferson, Ohio. She dies in Madison Iowa in 1867. Solomon Delong’s sister is a Mary who is married to an Arthur Chenoweth whose mother is an Elizabeth Baxter closely related to the Baxters with whom G. W. McKenney Sr.b. 832 is living in 1865. It is confusing that Rebecca would be in Oxford rather than Millford, if she is the wife of John of the 1840 Millford census, however, the Montgomeries live beside her and they were 8 households from John in the Millford census. Also, people that were directly adjacent to John of Oxford in the 1840 census are this year instead in the Millford census, while no McKenneys appear there. I’m supposing there was something going on with redistricting. By 1860, Rebecca is back in Millford and is there in 1870. NOTE: I am conjecturing this woman is the widow of John 1 who was in Millwood, Guernsey, Ohio in 1840. That household had 2 males 5 to 10 years of age who would be 15 to 20 and possibly out of the home, except for the above Allen. There were 2 males 10 to 15 who would be 20 to 25 and they would be out of the home There was also a male who was 15 to 20 who would be now 25 to 30 who I conjecture to be Robert Eugene McKenney. There were 2 females 0 to 5 years of age who would be now 10 to 15. Where are they? There were also 2 females 15 to 20 who would be now 25 to 30 and out of the home. Those are a lot of unknown McKenneys. The 2 females who would be 10 to 15 who are missing are troublesome. Did they die? Robert Eugene McKenney is in the Carlisle Township, Monroe Co. Ohio census and he and family in the household of a John Ray (unknown what connection the Rays have if any). NOTE: See all these Bevans? 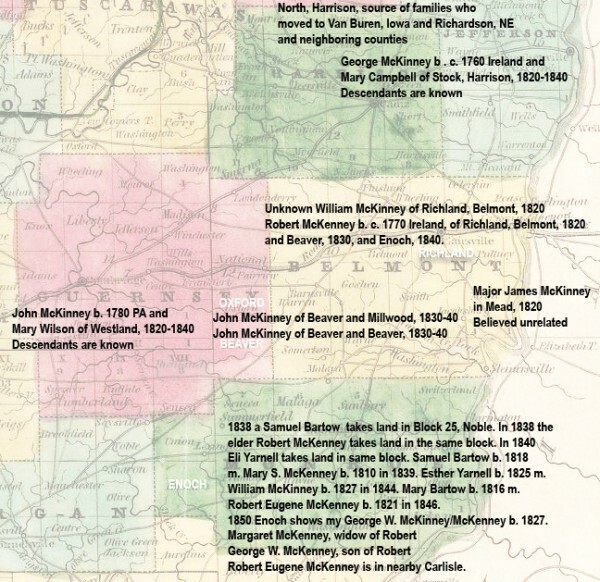 Take a look back at the 1820 census in Belmont, the William McKenney b. 1775 who disappears off the map after 1820. He has next to him a John Bevan. This Naomi is his widow an Jesse and Findley are his sons! Could John McKenney 1 b. 1795-1805 possibly have been a son of this William who was already out of the household? NOTE: This is Robert Eugene McKenney. The MCKENNEY family has already been in Iowa and back. Have yet to find why they may be in the Ray household. NOTE: Name seems to be McKITORICK or MCKITRICK according to a Genforum posting. There are other YOHOS in this census. They come from France to PA and are in Ohio Co. VA (now Marshall County West Virginia) by 1778. William MCKETOUCK was the husband of Nancy HARDESTY, daughter of Richard and Mary Lamb HODGES. Nancy HARDESTY’s cousin, Mary Polly (daughter of Obediah and Mary) married a Thomas IIAMS. Thomas had a brother, Samuel, who married Eliasabeth MEEK. Isaac IIAMS b. 1806 was adopted by them. William MCKINNEY b. 1795, the proposed eldest son of Robert McKenney b. 1770, married a Susannah HARDESTY. She was the widow of Samuel Hardesty who was a brother of the above Nancy Ann Hardesty. So we have here Robert Eugene McKenney living next to William McKenney’s wife’s first husband’s sister! NOTE: According to posting at Rhodes Genforum, Sanford RHODES married Margaret MOORE. Who is John S. McKenney? This below John appears as John S. in the 1860 Union, Muskingum, Ohio census. Sarchets appear again in 1880 Cambridge, Guernsey, Ohio beside another McKenney. Samuel Bartow and Mary S. McKenney are this year in Redding, Jackson, Indiana. By 1852 they will be in Hennepin, Minnesota where they will remain. Source Citation: Year: 1850; Census Place: Redding, Jackson, Indiana; Roll: M432_152; Page: 131; Image: 264. G.W. McKenney’s b, 1832 supposed brother, William McKenney b. 1827, is in Van Buren IA residing next to Ira Kelsey. See 1852 Spoonamore column. Note: Ira KELSEY’s sister, Rachel, married Hiram MURDOCK in Council Bluffs in 1848. Job Yarnell is in Lick Creek, Van Buren, Iowa. Frances Firebaugh, daughter of John Firebaugh and Elizabeth Friend, marries John Heaston in Harrison, Ohio and moves to the Nemaha Reserve. Amanda Rippeth, daughter of James Rippeth and Mary Amspoker, marries John Firebaugh, son of John Firebaugh and Elizabeth Friend, in Carroll Co. Ohio. In 1850 Thomas Charlton (a trader with the Sac and Fox). Nearby is the family of Robert Meek (born Wayne, Ohio), son of William Meek who arived in Van Buren in 1838, and on the other side of him is an Anderson Poe. In the Meek household is a 12 year old Cynthia Robb (nothing is known about her). Robert Meek’s niece marries Eugenus Glasscock 1871 in Van Buren Iowa (Glasscocks married into the William McKenney family abt 1887). His sister Mary is married to Thomas Charlton. Another sister of Meek’s, Rachel, is married to Anderson Poe. Unknown if this John Love figures in in anyway. I can find out nothing more about him. In Lick Creek, Van Buren, Iowa, Bluett Partlow lives next to Leger Stout and George Shaeffer, related to George W. McKenney (b. 1832) via Robert Eugene McKenney. William McKenney (b. 1827) is now in the county. G.W. McKenney’s (b. 1832) conjectured brother, William McKenney (b. 1827) is in Van Buren IA residing next to Ira Kelsey. See 1852 below. In 1850, a Gratten Poage, who had been residing in Jefferson, Monroe, Missouri in 1840 (where live other Poages) is now living next to David and Joseph Franklin in Perry, Allen, Ohio, brothers of Eli Franklin (married to Ellen Chenoweth) whose son William will marry Mary Roy. Residing in Jefferson, Monroe, Ohio in 1860 is a Elizabeth Margaret Poage who has married to a George Van Eman abt 1850. George Van Eman’s uncle was Nicholas Van Eman who was married to Margaret Baird. (See 1837 McKenney notes for relevance to Baird/Rigg family.) George and Elizabeth Poage Van Eman relocate to Van Buren, Van Buren, Iowa where in 1871 Martha Van Eman will marry Arnold Coles Barker, son of Joseph Barker and Anna Manchester. A sister of Arnold Coles Barker is married to Henry I. Shaeffer. Benjamin Heaston, son of John Heaston and Christina Gundy, marries Catherine Ann Rippeth, daughter of James Rippeth and Mary Amspoker, in Carroll County, Ohio. Joshua Wells Baker, blacksmith to the Sac and Fox, having died, his family moves to the Kaw Reservation. His daughter Eliza marries Thomas Sears Huffaker this year in Council Grove, Morris, Kansas. He is a missionary to the Kaw. His daughter Eliza marries Eli Sewell of Van Buren, Iowa, who was first in the Indian trade with the Sac and Fox then went to Council Grove. His daughter Sarah married Emmanuel Mosier who was first a blacksmith for the Sac and Fox and then a blacksmith for the Kaw in Council Grove. His son William, who married Isabel Frances Hackney, has moved out to Oregon. Years later he gives several newspaper interviews on his family having lived among the Sac and Fox. The George W. McKenney and Rhoda Scarborough McKenney family have already left Ohio. Their youngest son Samuel is born in Indiana. Robert Eugene McKenney is back out in Iowa. A son is born in Council Bluffs in 1853. He then moves out to Minnesota but is back in Ohio in 1860 and perhaps in 1880. In 1853 Rev. Edmund McKinney gives up his Otoe-Omaha missionary post in Bellevue/Council Bluffs to Rev. William Hamilton who had before then been a missionary to the Ioway with Samuel Irvin. This McKinney is descending down a different line of McKinneys and is no relation to our own. The Ioways and Sac and Fox remove from Wolf River to the reserve in Nebraska and Kansas. Treaty with the Ioway gives John Baptiste Roy the Wolf Grove land which is later sold to Samuel Irvin. Sac and Fox Wilson McKenney is in attendance at the Ioway Indian Mission school. 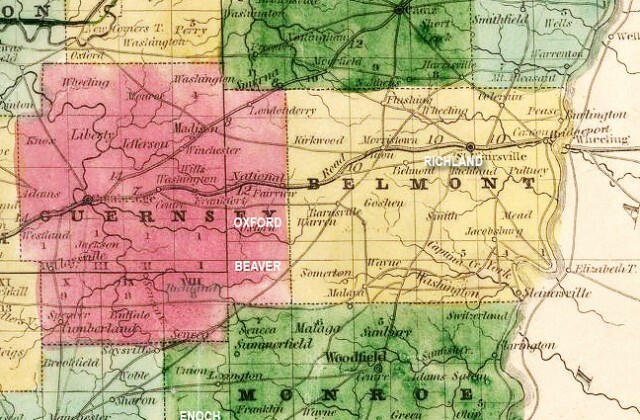 A family account gives Solomon Forney, in the company of his father, Peter, Mother Frances, and 41 others, going to Holt County, Missouri (neighboring the Nemaha) in 1849. Perhaps some family did move at that time. But it’s stated they were passengers on the Ben West steamer that sank near Boonville Mo. stranding them for three weeks. However, the Ben West, put into service in 1849, didn’t sink until August 10 1855. Henry I. Shaeffer, son of George Shaeffer and Margaret Saltzgiver, marries Eliza Jane Barker in Iowa. John Baptiste Roy observed in the Richardson, Nebraska Ioway Reserve census with a John Sperry, blacksmith, and a Thomas Lytle, b. Ohio, who serves as a carpenter. Job Yarnell resides in Lick Creek, Van Buren, IA beside son Ithamer Yarnell. George W. McKenney b. 1832 and Isabella move to Van Buren, Iowa and are in the census next to William McKenney b. 1827 in 1856. I am thinking that a good time for them to move would have been when all the Harrison County Ohio families were moving in 1855, but daughter Lucinda gives herself as born in Ohio in November of 1855. Smith Henshaw, living next to them, is from Belmont, OH and is given in bios as having moved in 1854 to Van Buren. Joseph Forney appears in the Richardson, Nebraska territorial census. Iowa, Van Buren, Lick Creek. Bluett Partlow lives next to Mary Buckmaster and George Shaeffer, related to George W. McKenney b. 1832 via Robert Eugene McKenney. William Oliver Picken marries Mary Shaeffer, daughter of George Shaeffer and Margaret Saltzgiver, in Iowa. John Baptiste Roy, merchant and proprietor of Roy’s Ferry at Rulo, dies. An individual who owes him money is a James W. Love (b. abt 1805 in Ireland) who is in the Rulo, Richardson, Nebraska census in 1860, as is his apparent son Elijah Henry Love who was born abt 1821 in PA. Nothing is known about this James W. Love. These Loves have nothing to do with Isabella. Now on to the 1860s.